Uttarakhand is famous among tourist for its natural beauty, Himalayan ranges, beautiful lakes, treks and breathtaking landscapes. Every year lakhs of tourist visit Uttarakhand for pilgrimage, leisure and adventure purpose. The places are located throughout in the Uttarakhand Himalayan ranges. It will be easy and the trip will be untiring if you know the exact location of the place and their distances among each other. It has become very easy to know the location by Google map. But there are also limitations of the Google map, it shows the right distances between the places but it does not calculate the right travel time. The average speed of the vehicle comes very less around 25-30 km per hour on the hilly winding roads. And sometimes roads are not proper or there is traffic congestion. It is necessary to plan well before you book the hotels and start the trip. There are two regions in Uttarakhand; one is Garhwal and the other is Kumaon region. You should know very well that in which region your places of interest are located. 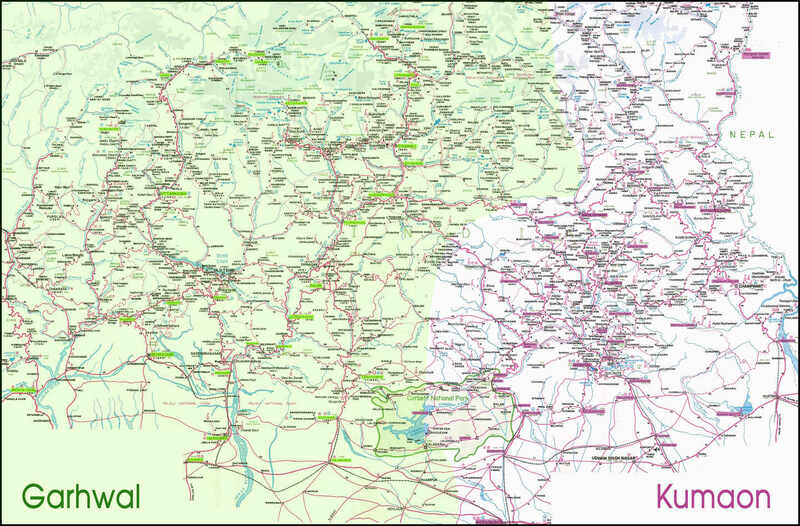 Both these regions are connected by road through Karanprayag and Ramnagar. Garhwal Region: Garhwal region has lots of famous tourist destinations like Haridwar, Rishikesh, Dehradun, Mussoorie, Chakrata, Chopta, Auli and Khirsu and Raja Ji National Park. The famous pilgrim places like Badrinath, Kedarnath, Gangotri, Yamunotri, panch prayags, Panch Kedar, Panch Badri, Joshimath and many more are located in Garhwal region. Train: Garhwal is well connected by trains. The trains come up to Haridwar, Rishikesh, Dehradun and Kotdwar. Air: Dehradun airport is well connected through Delhi. All the major airlines come to Dehradun from all over India. Kumaon Region: Kumaon is famous for leisure travel. The famous tourist places like Nainital, Almora, Binsar, Ranikhet, Kausani, Mukteshwar, Munsyari, Pithoragarh and Corbett National Park is located in Kumaon region. Train: Kumaon is well connected by trains. The trains come up to Ramnagar, Kathgodam and Tanakpur. Air: The airport is located at Pantnagar. Air India operates flights on Friday and Saturday.